Background: Fasting, anesthesia and surgery lead to metabolic stress response. Increase of cortisol level lead to insulin resistance and hyperglicemic state has significant effect to the wound healing and increase morbidity and mortality to the patient undergoing surgery. The aim of this research is to prove that preoperative oral glucose loading can decrease metabolic stress response and also the difference effect on preoperative oral glucose that given twice and once time to decrease metabolic stress response in patient undergoing major oncology surgery. Methods and Materials: Fifty four patients undergoing major oncology surgery were randomly selected with consecutive sampling method. Patient was divided into 3 groups and each groups consisted of 18 peoples, first treatment group was given oral glucose solution preoperatively at night and early morning, second treatment group was given oral glucose solution in the morning preoperatively and the control groups were given only mineral water at night and early morning preoperatively. The blood glucose and cortisol level was measured at the morning before surgery and after surgery. Comparative analysis based on the normality test, One Way Anova test for the normal distribution data and Kruskal-Wallis test if the data distribution is not normal. Post hoc tests was using LSD test. Result: The increase of blood glucose level significantly lower on first treatment group compared to control group (p=0.041). The increase of cortisol level significantly lower on first treatment group compared to both of second treatment and control groups (p<0.001). Conclusion: Preoperative oral glucose loading reduce the increase of blood cortisol and glucose level postoperatively compared with patients who fasted preoperatively. Then, giving an oral glucose twice (evening and morning) preoperatively more effective to reduce the increase of cortisol and blood glucose level postoperatively compared with patients who given oral glucose only in the morning preoperatively. Surgery is a condition with combination of anesthesia, medication, tissue trauma, blood loss, and changes in temperature. These things stimulate metabolic changes and simultaneously causing postoperative stress response . Surgery stimulate the increase of counter regulatory hormones (catecholamines, glucagon and cortisol) . Cortisol is a glucocorticoid steroid hormone produced by cells in the zone fasciculate the adrenal gland in response to stimulation Adrenocorticotropic Hormone (ACTH). This hormone works by increasing blood sugar levels through the mechanism of gluconeogenesis, suppress the immune system, and increases the metabolism of fat, protein and carbohydrates . Levels of the cortisol hormone in circulation is a very strong predictor of an increases from insulin resistance as a result of post-surgical stress response . The increased of cortisol level, resulting in insulin resistance and hyperglycaemia which have a significant effect on the healing process and lead to increase morbidity and mortality in patients undergoing surgery . On the other hand, preoperative fasting in order to reduce the risk of pulmonary aspiration routinely done for elective surgery patients. Mentioned that fasting more than 4 hours can lead to a change in the ratio of insulin glucagon. This situation, in turn, causes a stress response to surgical trauma and had a major influence on glycaemic control and insulin resistance . The last few years there is a revision of the guidelines of several countries such as America, Canada and Europe that recommended reducing the preoperative fasting duration with the provision of water or a glucose solution for a few hours prior to elective surgery can improve patient comfort and safety . Study from Mathur et al. in New Zealand, conducted in two groups of patients undergoing elective major abdominal surgery, this study showed the decrease of cortisol level was significantly lower in the group given oral glucose preoperatively on the night and two hours in the morning before induction than the group of patients given placebo on the first postoperative day . This study aims to determine whether administration of oral glucose preoperative can reduce the metabolic stress response define by cortisol and blood glucose levels postoperative in patients undergoing major oncology surgery, and also to determine the effect of frequency during administration an oral glucose preoperative against metabolic stress response. Fifty four patients aged between 16-65 years undergo major oncology surgery with general anesthesia incorporated into this study. Diabetic patients with HbA1c>6.5%, patients with BMI less than 17 kg/m2 or more than 30 kg/m2, patients with physical status ASA III - V, patients with hormonal and steroids therapy as well as patients with combined general and regional anesthesia were excluded in this study. Durante surgery bleeding more than 30% of Estimated Blood Volume (EBV) and duration surgery more than 300 minutes were dropping out from the study. The fifty four samples divided into three groups: the first treatment group (n=18), second treatment group (n=18) and control groups (n=18). The first treatment group had solution contain 75 grams of glucose anhydrate dissolved in 300 ml water in the evening before the surgery at 09.00 pm and the morning before surgery at 05.00 am, subsequent the second treatment group was given 300 ml mineral water at 09.00 pm in the evening before the surgery and solution which contain 75 grams of glucose anhydrate dissolved in 300 ml water in the morning before surgery at 5.00 am preoperatively, and the control group only had mineral water at 9.00 pm and 5.00 am preoperatively. Cortisol and blood sugar level drawn at 5.00 am before patient takes the solution and at 1.00 pm postoperative on the day of surgery in the recovery room. Mean comparison test conducted aiming to compare the levels of cortisol and blood glucose by the treatment groups. Comparative analysis based on the normality test, One Way Anova test for the normal distribution data and Kruskal-Wallis test if the data distribution is not normal. Post hoc tests was using Least Significant Differences (LSD) test if the variant is homogenous or Tamhane's test if variant data is not homogeneous. The level of significance was p<0.05. The entire data analysis of this study will be done with SPSS version 20 for Windows . The total number of samples in this study met the inclusion criteria as much as 54 samples with the amount of each treatment group and the control group were 18 people. All of samples met the acceptance criteria and none met the drop exclusion criteria. At the time of the study there was no sample drop out, so that 54 samples are to be the subject of eligible that further data will be analyzed. Characteristics of the sample by age, gender, ASA physical status, BMI, duration of surgery and the amount of bleeding are listed in Table 1. Based on the statistical test results that are tailored to the scale of the variable data, it can be concluded that the characteristics of the subjects between groups had comparable. Table 1: Sample characteristic based on sample groups. A comparative of hemodynamic conditions intergroups are listed in Table 2. Based on statistical test it can be concluded that the hemodynamic conditions of the subjects between groups had comparable. Table 2: Hemodynamics condition based on sample groups. Mean increase blood glucose level the control groups was higher than the the first and second treatment group. Based on the statistical test there was weak evidence against the null hypothesis (p=0.089), than it is important to look at the post hoc analysis between each groups. The mean increase cortisol levels in the first treatment group was 27.3 nmol/L with a SD 16.0; in the second treatment group was 53.7 nmol/L with SD 17.0; and the control groups was 119 nmol/L with SD 38.2. There were significant differences in increase of the cortisol level among three groups of samples (p<0.001). Comparison of increase blood glucose levels between the first and second treatment group were not significantly different performed with LSD post hoc test (p=0.735). However the difference was significant between the first treatment and control group (p=0.041), then between the second treatment and control group there was weak evidence against the null hypothesis (p=0.085) (Figure 1). 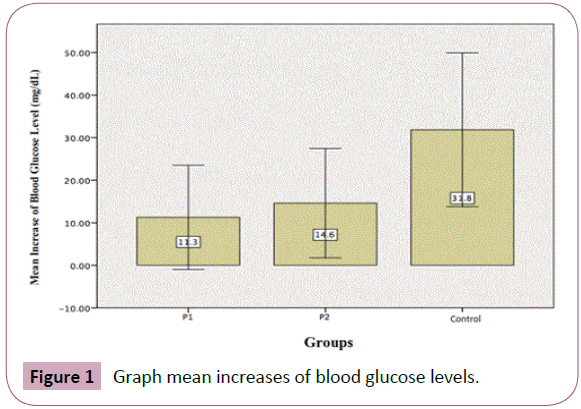 Figure 1: Graph mean increases of blood glucose levels. Likewise there were an increase mean cortisol levels between the first and the second treatment group were significantly different (p<0.001), thus between the first treatment group with the control group were significantly different (p<0.001) as well as the second treatment group compared with the control group were significantly different (p<0.001) (Figure 2). Figure 2: Graph mean increases of cortisol levels. The 54 sample in this study had comparable characteristics by age, gender, ASA physical status, BMI, amount of bleeding, operating time and hemodynamic conditions. Mean postoperative blood glucose level in first treatment group is 104.6 mg/dL with SD 24.1; in second treatment group 104.1 mg/dL with SD 25.2 and control groups 143.2 mg/dL with SD 44.3. There was significant different between postoperative blood glucose level among the three sample groups (p=0.001). Mean increase of blood glucose level in first treatment group is 11.3 mg/dL with standard deviation 24.6; in second treatment group 14.6 mg/dL with standard deviation 25.8 and control group 31.8 mg/dL with standard deviation 36,3. The mean increase of blood glucose level in control group was higher than first and second treatment group. With One Way Annova test got p=0.089 which can interpretate there was weak evidence against the null hypothesis, than it is important to look at the post hoc analysis between each groups. Comparison of the mean increase of blood glucose level between first and second treatment groups shown no significantly different on post hoc LSD test (p=0.735). Whether comparison between the second treatment group and control groups shown weak evidence against the null hypothesis (p=0.085). Comparison between first treatment group and control group shown increase of blood glucose level significant higher in control groups than in first treatment group (p=0.041). This is appropriate with the research by Perrone, et al. conclude that increase of the blood glucose level lower in sample groups who got oral glucose solution on the night and morning before surgery than placebo groups . This result shown that administration of oral glucose solution preoperatively, especially twice on the night and morning give significant effect on lowering the increase of blood glucose level postoperative. It is very useful to prevent any morbidity caused by hyperglycaemic condition. Statistically there were no significant different in postoperative cortisol level among the three sample groups (p=0.275). However, if we look at the mean increase of the cortisol level from the basal level preoperative with Kruskal-Wallis test there was significantly different among the three sample groups (p<0.001). The increase of cortisol level on first treatment group significant lower than second treatment group by Mann-Whitney test (p<0.001). Similarly the increase of cortisol level on first treatment group significant lower than control group (p<0.001), and the increase of cortisol level on second treatment group significant lower than control groups (p<0.001). This result appropriate with the research by Mathur et al. 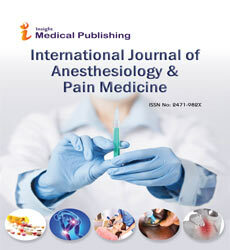 at New Zealand, on patient undergoing elective major abdominal surgery, that compared sample groups who got oral glucose solution preoperatively on night and morning 2 hours before induction of anesthesia compared with placebo groups that result significant decrease in cortisol level on the sample groups who got oral glucose solution than placebo groups on the first day after surgery . This result also matched to the theoretical concept that administration of oral glucose solution preoperatively can trigger the insulin secretion, thus change the patient’s metabolic status from fasted state to fed state . The main stress response as a result of surgical trauma is the release of stress hormone and cytokine that comparable with the level of the trauma. Increase of catabolic reaction and loss of anabolic action from insulin stimulates the insulin resistance. Increase of catabolic reaction caused by breakdown of the muscle tissue and increase loss of the energy deposit that correlated with decrease of recovery time after the injury because the key to accelerate the recovery time is to minimize negative metabolic response caused catabolic reaction from stress condition with hold energy and protein balance, so the administration of preoperative nutrition have important role for recovery time after surgery . This research result absolutely instrumental/practical as a reference for preoperative preparation in surgical patient undergoing elective major surgery, to reduce the surgical stress response and a better clinical outcome. Major surgery cause an increase in postoperative cortisol and blood glucose level. Providing oral glucose solution preoperatively can lowering the increase in cortisol and blood glucose levels compared with patients who fasted preoperatively. Administration of twice oral glucose solution (evening and morning) before surgery more effective in lowering the increase of cortisol level but not significant in lowering the increase of blood glucose level compared with patients who given oral glucose solution just once time (only mornings) preoperatively. Hager P (2008)Systemic stress response and hyperglycemia after abdominal surgery in rat and man. Stockholm: Karolina University Hospital Huddige. Jovanovski-Srceva M, Kuzmanovska B, Mojsova M, Kartalov A, Shosholcheva M, et al. (2015) Insulin Resistance, Glycemia and cortisol levels in Surgical Patients who had Preoperative Caloric Load with Amino Acids. Pril (Makedon Akad Nauk Umet Odd Med Nauki) 36: 61-70. Guyton AC, Hall JE (2006) Textbook of Medical Physiology.Eleventh edition. Elsevier Inc,Philadelphia. pp: 829-834. Gjessing PF (2014) Postoperative insulin resistance and the metabolic and cellular responses to single-dose preoperative oral carbohydrate supplementation. Experimental studies in pigs (dissertation). The Arctic University of Norway, Norway. BrinckmannLR, Juliana P,X Daieni F, Fernanda S(2013) Lesser Time Of Preoperative fasting and Early Postoperative Feeding Are Save?Arg Bras Cir Dig26:54-58. Perrone F,Antonio C da-Silva-Filho, Isa F Adorno, Nadia T Anabuki, Fernando S Leal, etal. (2011) Effects of Preoperative Feeding With A Whey Protein Plus Carbohydrate Drink on The Acute Phase Response And Insulin Resistance. A Randomized Trial. Nutrition Journal 10:66. Mathur S,Plank LD, McCall JL, Shapkov P, McIlroy K, Gillanders LK, etal. (2010)Randomized Controlled Trial of Preoperative Oral Carbohydrate Treatment in Major Abdominal Surgery. Br J Surg 97: 485-494. Hill LT, Miller MGA (2015) Clinical practice : Carbohydrate loading in the preoperative setting. S Afr Med J105:173-174. Ljungqvist O (2015) Metabolic Responses To Surgical Stress. Espen Orebro, Sweden.